Regardless of where you are in your spiritual journey, I pray that you might be always drawing closer to God. As I went for a run this morning a prayer written by Steve Taylor came to mind and I prayed as I ran. In all of the activity of life: teaching, mentoring, preaching, planning, and writing, "I just want to know am I pulling people closer; I just want to be pulling them to You. I just want to stay angry at the evil. I just want to be hungry for the true. . . . Oh, search me Father and know my heart, try me and know my mind. And if there be any wicked way in me, pull me to the rock that is higher than than I." May you always be drawing closer to God. For three nights only, our solar system put on a great show. 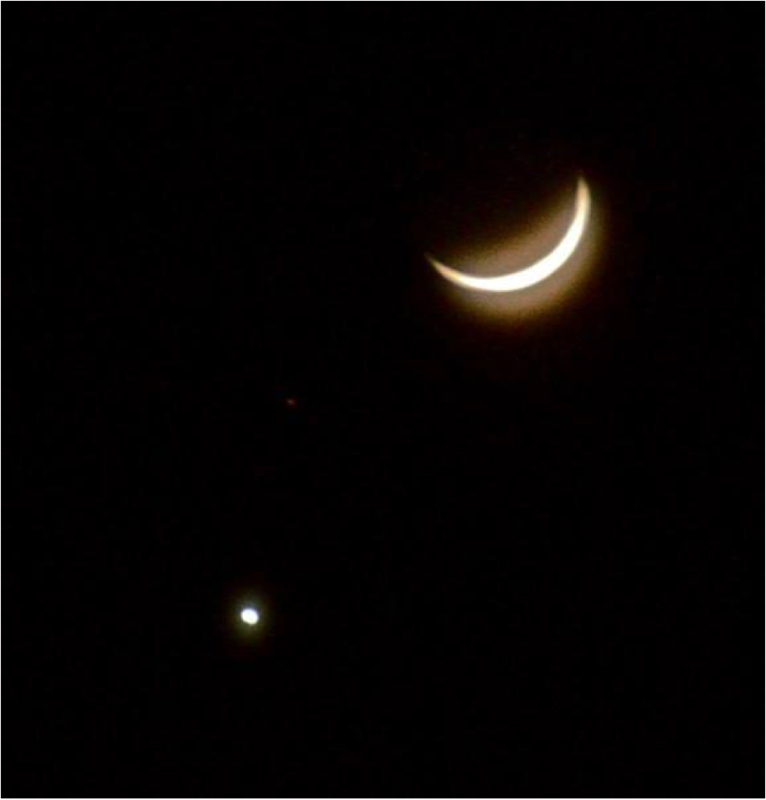 For those who were under clear skies and looked west, they could catch a glimpse of both Venus and Mars. Just after sunset, from February 19 through 21, both planets could be clearly seen above the horizon. If you looked at the right time you could also see a waxing crescent moon close by. 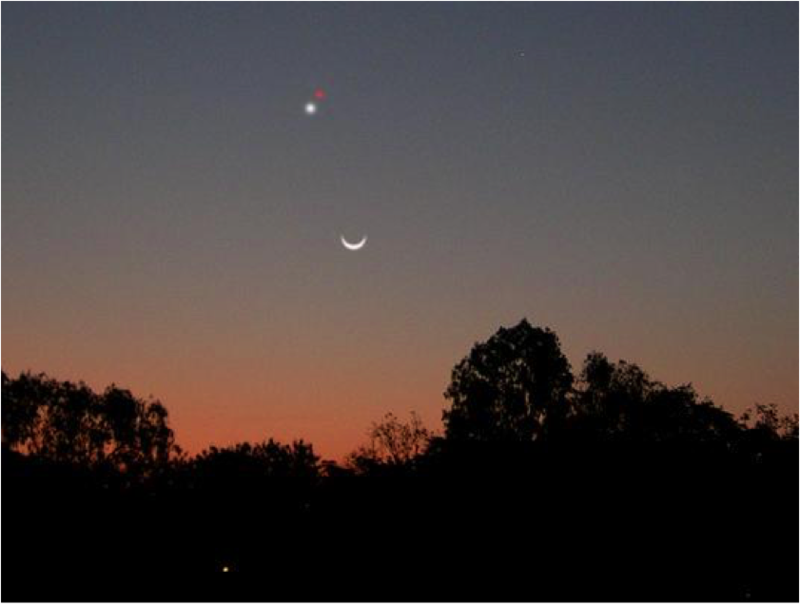 This conjunction of planets reminds us of our perspective in the solar system. Our planet is relatively close to these other planets moving around our sun. Mars, is a mere 225,300,000 km from earth (on average) while Venus (on average – although it varies between 38 million and 261 million km) is 41,900,000 km from earth. But it is the unique orbits of all three planets that create this apparent conjunction. From our perspective, we are looking at Venus and Mars as their orbits swing them around until they are very nearly aligned with each other. It makes for a great show: Venus, the bright, white light, Mars, the dim red light, and a sliver of moonlight to give us perspective. Many people captured this phenomenon on cell-phone cameras and other more sophisticated lenses. Here are two images from social media. Photo Credit: Daniel Smith, Three Hills, Alberta. The band Jars of Clay sings about a “Reckless Forgiver” (listen to the song here) on their album Inland. I leave it to your imagination as to who it is that truly forgives recklessly. I may not be fully capable of reckless forgiveness but I certainly could be more generous with my forgiveness. Writers: Charles Daniel Lowell, Daniel Paul Haseltine, Matthew Thomas Odmark, Stephen Daniel Mason; Copyright: Middle Space Publishing (BMI), Grow Your Own Music O.B.O. Middle Space Publishing. Today, I want to ask the question, "Why are we here?" That is, why does the universe exist; and why do we humans exist in this universe? As a response, I will list a few interesting quotes from others who have pondered this question. The reader can meditate upon these responses and consider the path of inquiry which will then be most satisfying. In a documentary entitled "Why Are We Here?" Dawkins goes on to say that the universe has "no purposeful design" and that humans "provide the purpose. "3 Essentially, what he is saying is that the purpose of the universe is what we humans decide. We give the universe the only purpose it could possibly have. At this point in history we find two premises alive in the world. One is that the universe spontaneously came into being. The other is that a Creator caused the universe to come into being. It seems to me that all of our understanding, values, and philosophy are then derived from one premise or the other. As we meditate upon these two premises, we must consider well our own understanding and the implications for how we will live our lives. 1 Tolstoy, Leo. A Confession, The Gospel in Brief and What I Believe (trans. by Aylmer Maude). London: Oxford University Press, 1958; pp 27-31. And hands that stretch and fully raise. On this your day, our precious Kate. As a curious person, I often ask the question, "What is that made of?" Today's blog will take us on a journey as we ask this question about plastic. One of the simplest forms of plastic is polyethylene. The chemical formula for this molecule is (C2H4)nH2. The type of polyethylene varies with the value of n.
So, this plastic is made up of carbon atoms and hydrogen atoms. Carbon atoms are made of six neutrons, 6 protons, and 6 electrons while hydrogen atoms are made of one proton and one electron. Neutrons are made of two "up" quarks and one "down" quark while protons are made of one "up" quark and two "down" quarks. Electrons are made of . . . well . . . electrons. At this point, we believe electrons to be indivisible quantum particles, just like "up," "down," and other types of quarks. On the other hand, another theory is that all of these elementary particles would be better modeled as vibrating strings. But we will save the discussion of that theory for another day. Researchers at the Large Hadron Collider (LHC) in Cern are discovering that quarks can interact and form intermediary groupings of two, three, and four quarks. Recently a particular particle containing four quarks was discovered by analyzing the products of multiple collisions in the LHC. So, the next time someone asks you the component parts of something, ask them how far down they would like to go. This universe continues to inspire awe in the one who created it. I listened to the new "Drew Holcomb and the Neighbors" album, Medicine today. Drew Holcomb is an American singer song-writer who just happens to be married to Ellie Holcomb (nee Elizabeth Bannister), the daughter of singer, song-writer, producer extraordinaire, Brown Bannister. I like the recording a lot and there are some really good songs on it. "American Beauty" may be my personal favourite. The album is certainly better produced than the previous album Passenger Seat; but, in my humble opinion, Passenger Seat has the better songs. "Hallelujah," on the Passenger Seat recording, is a great story of rock and roll worship bands (yes, in this case, "rock and roll" and "worship" can be put together) and asks interesting questions about the motives of contemporary worship music leaders (see it performed here). However, the song on Medicine which caught my attention the most, caught it for all the wrong reasons. "Sisters Brothers" seems to me to be simply a mellow reworking of Serena Rider's song "Stompa." Take a listen to the two here (starts at approximately 20:35) and here. The similarity probably falls short of copyright infringement, but "Sisters Brothers" is similar enough to make one think that Drew has been listening to Serena. If there is any redemption in all of this, it is that Drew Holcomb has improved on the meaning of Serena Rider's song. There is truth in the bridge Holcomb has written. Below are the rest of the lyrics to "Sisters Brothers." Music, 2014. BMI. Music Admin. Since before the writings of Shakespeare, authors, politicians, teachers, script-writers, and preachers have known that if you want people to hear what you have to say and keep talking about it long after the event, you must start with a spectacle. Shakespeare’s best-known example, the three weird sisters (or witches) at the introduction of Hamlet, was designed to capture and hold the attention of both commoners and royal family members. The Half-Time spectacle at Sunday’s Super Bowl, piloted by Katy Perry, was an attempt to do the very same thing; and people were talking about it after the spectacle had fizzled down to a few late sparkler-type fire-works. The producers of the show clearly had two audiences in mind. One audience was 72,200 University of Phoenix Stadium viewers and the other audience was the 114.5 million television viewers. This time both audiences were treated to the same spectacle, but I wonder how long it will be before someone gets the idea of delivering two different shows to the two distinct audiences. The question that comes to my mind is this: how do the rest of us mere mortals hope to get anyone to listen to us? Very few have the budget that Super Bowl producers have to throw at a message. If I want to make an announcement at church, I may throw in a small joke to keep people alert and focused, but I have never considered riding a tiger puppet across the stage to make my point. Well, okay, I did consider it, but the finance team wouldn’t give me the budget. In another place and another time, the message delivered in most churches on Sunday mornings is far more consistent. In simple terms, the message is “Love the Lord your God with all your heart, soul, and mind. Love your neighbour as yourself.” Must we create a spectacle to get people to hear this? Or are we missing a whole other medium? Rather than competing with the spectacles, perhaps we could model a different message. Perhaps we could be the simple Simon and Garfunkel with a guitar and straightforward harmonies. 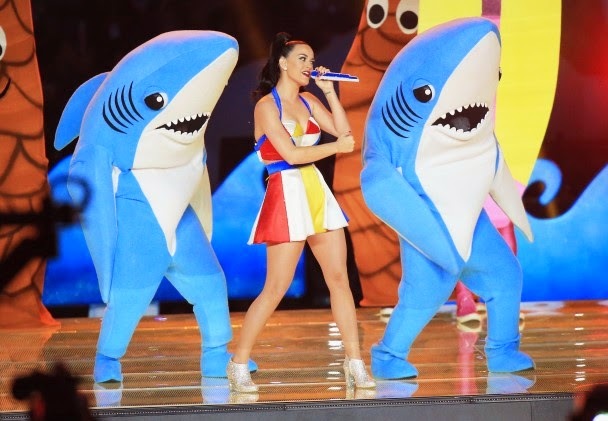 (Not a bad idea for next year’s Half-Time Show.) Perhaps we could be Martin Luther King Junior with a message of non-violence and a life-style of non-violence to back it up. Perhaps we could be Jesus to the people of this overly entertained continent.